Want picture-perfect hair? Slip this beaut comb into the back of your ponytail or use it to hold your hair away from your face. 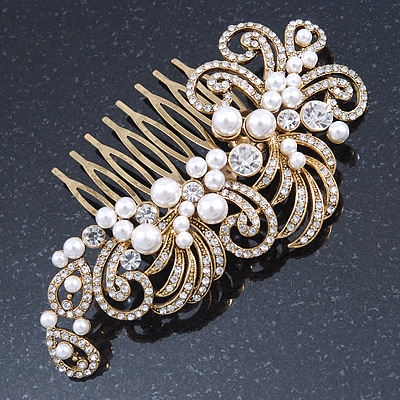 Featuring a gold tone hair comb with a large feather design, encrusted with clear Austrian crystals and white coloured glass pearls. The comb measures 100mm across and is approximately 65mm long.